Spring is finally in sight! In just a few short weeks the snow should melt, temperatures should rise, and the dreary days of winter should finally be in the past. Cleaning up the leftover snowy mess is undoubtedly the worst part of the first few weeks of spring. Snow melts and leaves accumulated dirt behind. This can be especially nasty for your awning. Even if you practice good snow removal, your awning is still exposed to the outdoors 24/7. You won’t want it looking grimy when it’s finally visible. Cleaning your awning is a simple task and will help extend its life far beyond spring and summer. The sun is shining, you’re wearing a tee-shirt, and you’re ready to tackle some serious spring cleaning. Start with a broom when it is your awning’s turn for a spring sprucing. The bristles won’t be too harsh on the fabric, and you’ll need to remove any debris and dirt that have had the chance to accumulate. This part of the process doesn’t require a ladder, but if you do head up to the top, you’ll be able to clean more thoroughly. The next step in the awning cleaning process is to break out your hose. It’s probably been disconnected and shut-off for many months, so this could take a minute. Soak your awning well, and watch with satisfaction as grime and dirt fall away. This will create a nice base for a home-made cleaning solution to work its magic. As long as your awning isn’t suffering from any major stains, there is no need to purchase cleaner. Mix one gallon of lukewarm water with two ounces of dish soap and combine. This will create a nice, mild cleaning solution for your fabric awning. 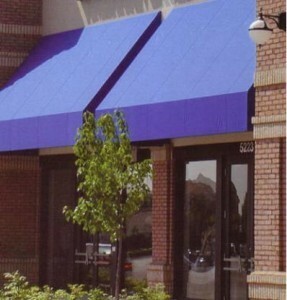 Use a soft-bristled brush to work the solution into the fabric of your awning paying special attention to dirtier areas. Give the solution a little bit of time to soak in after you’ve applied it. Once you think it is sufficiently soaked, bring out the hose again. Make sure that you get all of the cleansing solution out of your awning, and let it air dry. If you notice that the initial cleaning just didn’t do the trick for a few pesky spots, make a more concentrated version of your cleansing solution. Combine one cup of lukewarm water with two ounces of dish soap and use a tooth brush to scrub the solution into the spot. Let it soak and rinse it out.